I have sat through a good number of depressing films: Chinatown, Schindler’s List, The Hours. The list goes on. When I decided I needed to add Sophie’s Choice, part me me didn’t want to subject myself to another dreary afternoon of holocaust stories and unhappy endings. 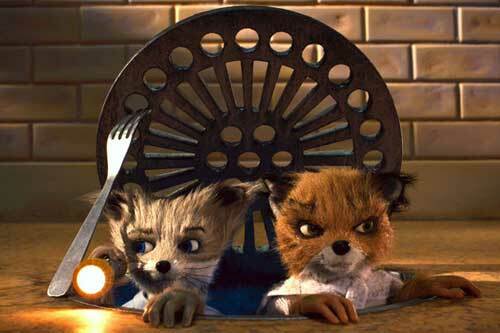 But a bigger part of me, the kind that likes to explore, prod and see every movie ever, had to see it. Sophie’s Choice is the story of three friends, their time together and Sophie’s past. Stingo (Peter MacNicol) is a young, naive writer who moves to Brooklyn from the south, looking for more experience in life. 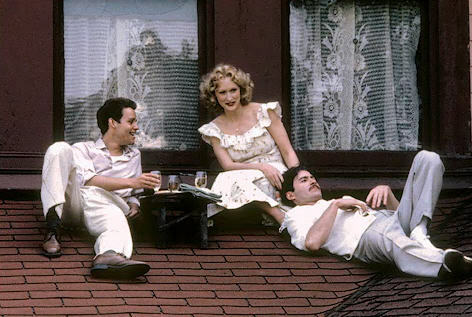 In his boarding house he meets a couple, Sophie (Meryl Streep) and Nathan (Kevin Kline). Sophie is a beautiful Polish woman who survived time in Nazi concentration camps. 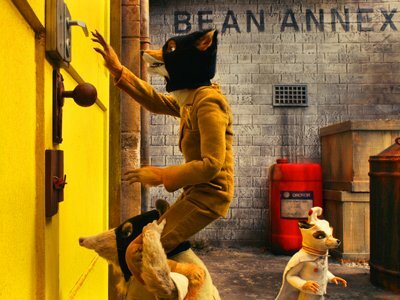 Nathan is an eccentric man, whose moods can shift from jubilant to angry-depressive bewilderingly. The three becomes friends and along the way Sophie confides more and more of herself to Stingo. Compared to the most depressing film experience of my life (watching Schindler’s List alone in my college dorm room on a Saturday night, which I do not recommend), Sophie’s Choice isn’t too bad. Sure, we see that Sophie’s and Nathan’s relationship is only toxic or that Stingo probably won’t find happiness in Brooklyn, but not all their time together is awful. Thing is, they do have some good times, wedged in between the spiraling downturn. And then there are the holocaust memories. No one wants those. They’re so bleak and depressing but nothing shown is too awful. Until Sophie tells Stingo the one thing she has never told anyone. That, that awful choice, the one I knew was coming, nothing can really prepare you for it. I imagine if you do have children, it’s even harder to watch. A main problem I see in this film is that Stingo’s story seems a bit lost in the plot. I understand that he’s not the main interest, that goes to Sophie, but he’s our narrator, the anchor in this story and we just seem to watch everything happen around him. There are scenes that pique my interest about Stingo that just happen and are never referenced again. What happened to that girlfriend of his, Leslie? Was his writing getting anywhere? How does he feel about becoming a third wheel to Nathan and Sophie? But I have to remind myself that Stingo is simply our gateway to observing Sophie. 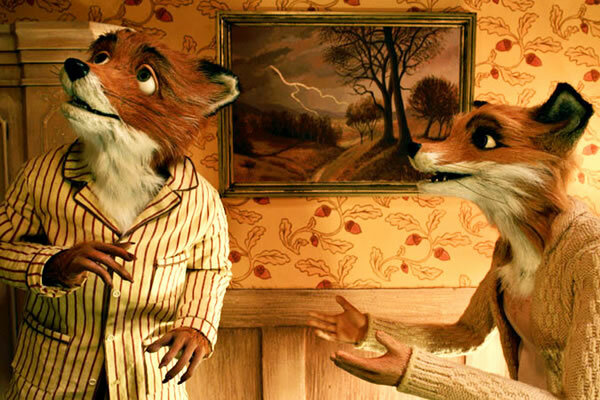 And this film was nominated for best adapted screenplay, so what do I know? 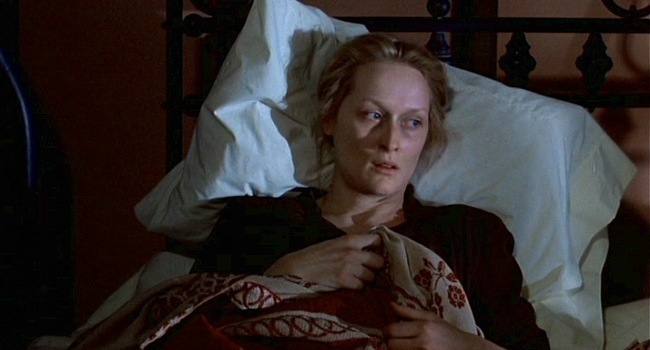 Meryl Streep’s portrayal of Sophie is amazing and obviously Oscar deserving. While at first glance Sophie is meek and frail against Nathan’s strong presence, she becomes an amazing woman who has been through so much. She is this beautiful combination of broken, struggling, painfully trying to find reason to live and yet able to enjoy life. The worst has happened to her, she has survived, but perhaps she doesn’t know why. And she can only move on with Nathan, or somebody, finding worth in her. She has many endearing moments and unexpectedly hilarious lines that come out of Sophie’s broken English. That Polish accent sounds authentic and must have taken a long time to master. And that scene when she arrives at Auschwitz, it sealed that Oscar envelope. The film was nominated for five awards total: cinematography, original score, costume design, adapted screenplay and lead actress. Streep took home the only Oscar for her role. Among the best picture nominees, Sophie’s Choice could have easily been swapped in for one of the films. Probably not E.T. or Gandhi though. Sophie’s Choice is one of those movies film buffs feel like they should eventually see, but may not. It’s long, not a very fun ride, gets depressing and ends that way. The main reason to see it is for Streep’s acting. In previews, The Iron Lady surely looked Best Picture bound. A biopic about Margaret Thatcher starring Meryl Streep seemed like a shoo-in. However, between some odd editing choices and perhaps too much focus on Thatcher’s dementia in her old age the whole film became a bit muddled. Many will place the blame on director Phyllida Lloyd, her only other film that was released to theaters was Mamma Mia!, also starring Streep. But if you ask me, going from a happy Abba inspired musical to Thatcher biopic is extremely gutsy and to pull it off as well as she did is an accomplishment. 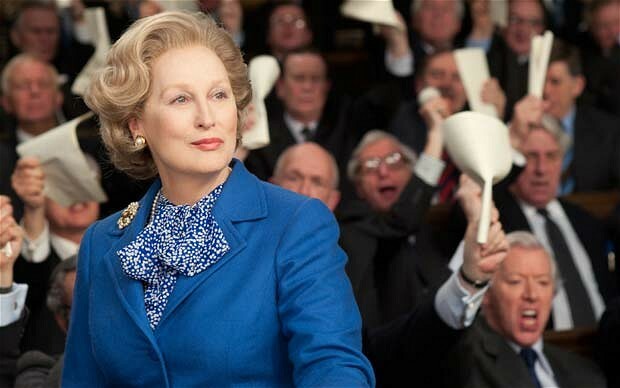 However, I’d like to focus on the greatest thing about The Iron Lady, Meryl Streep’s performance. 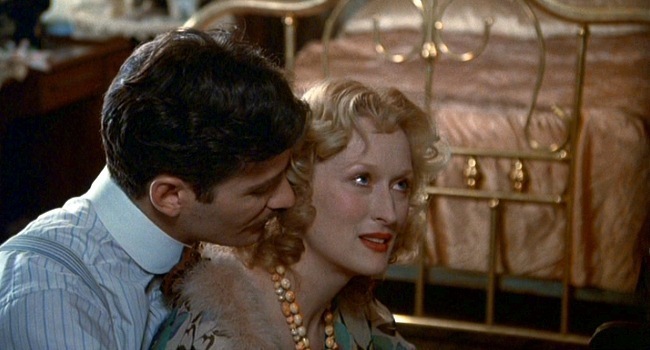 After nearly twenty years with twelve other Oscar nominations, never another win since Sophie’s Choice, this role finally brought Streep her third Oscar. It was quite a surprise, with most critics betting on her always a bridesmaid, never the bride status and predicting Viola Davis would come out on top. After seeing this film, I have to agree with the Academy, Streeps performance was amazing and well deserved the award. Streep portrays Thatcher through most of her political career and into her old age. In the present, we see Margaret shuffling about her home, remembering her past and suffering from dementia. The worst part is that she realizes her mind is going. She regularly imagines her late husband around, talking to her, carrying on conversations and bringing up memories of their life together. Her present is a bit sad when we think about the game changing, strong and powerful world leader she once was. In flashbacks, we gets a sense of Thatcher’s struggles and political rise. For a while, it seems that being a woman is a handicap Thatcher must work to overcome. A scene where a vocal coach teaches her to naturally lower her voice feels like it could have been inspired by similar scenes in The King’s Speech. Over the years, she seems to transform from strong willed British housewife to the tough as nails woman, making difficult decisions for her country without batting an eyelash. In one scene, Thatcher is preparing for an occasion of some sort and has a seamstress sewing on a button at the last minute, right over her bosom leaving it much more exposed than usual. While that is being taken care of, she carries on an argument with two of her political advisers. She never misses a beat, stays particularly strong and stands her ground with confidence. The whole time, it’s as if she were a man having a button sewn on his jacket having this conversation. She doesn’t show one bit of female frailty or shy away in such an awkward position and I think that makes her one hell of a powerful lady. In this day and age, divorce and single parenting are more common than ever, but no one will say that either are easy. 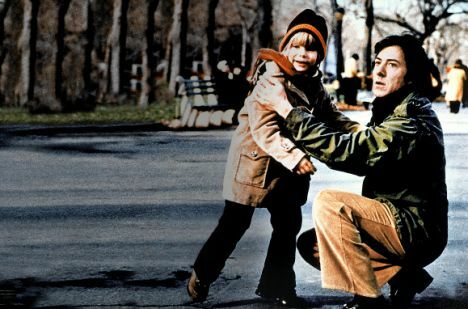 In Kramer vs. Kramer, Ted (Dustin Hoffman) is a hardworking husband and father, whose wife, Joanna (Meryl Streep) is so depressed and unsatisfied with herself that she decides to leave her husband and son. She has clearly thought about this for a while and planned everything out, even making sure to give Ted a dry-cleaning ticket. Now Ted has to figure out how to juggle his job and taking care of his son, Billy (Justin Henry) without any help. The morning after Joanna leaves, Ted tries his hardest to act like nothing is wrong for Billy’s sake. Attempting to be a cheerful super-dad, Ted tries to make French toast for breakfast with Billy watching. The stress is starting to weigh heavier on Ted, and we wonder if he has ever done this before as Billy notices shells going into the eggs and realizes they’ve forgotten the milk. The whole thing is a frazzled mess, ending with Ted burning his hand and cursing enough to upset his son. So much for a good start. At work, Ted’s boss doesn’t seem to care that his wife just left him. He shrugs it off, reassuring Ted that she will be back, but just in case, he adds that Ted should think about sending Billy to live with some relatives. It is clear that in that job, Ted is discouraged to let his family come first, and he may end up paying for that later. As the months wear on with no Joanna, Ted and Billy bond more. We’re shown moments with Ted nervous for his son in a classroom play and teaching Billy to ride his bike without training wheels. These small scenes score big father-son points and soon the two seem to thrive with just each other. Though at times it seems they have settled into a bachelor lifestyle; one of my favorite details of the film is when they’re eating TV dinners. One of the most moving scenes is when Ted runs nonstop for what seems like miles carrying Billy to the hospital. He has just taken a fall off the jungle gym, like most kids will inevitably do, and suffered a nasty cut on his face. The way Ted runs with such urgency, barely looking for traffic, cradling his son but not letting his weight slow him down is an amazing portrait of a father’s love. The issue the film brings up about single parenting was not new, but by having the mother leave, rather than the father, made this film more eye-opening at the time. It broke boundaries and made people question the thinking that mothers are just naturally nurturing and fathers couldn’t possibly handle all the aspects of parenting on their own. When Joanna and Ted fight for custody of their son, the film does not give us a clear-cut winner. Instead, in the courtroom, we are shown each side of the case without a bias. From the way we’ve seen Ted and Billy grow together, we have our own opinion. But by only hearing the case, the verdict could be different, especially with the concept that mother’s naturally make better parents. 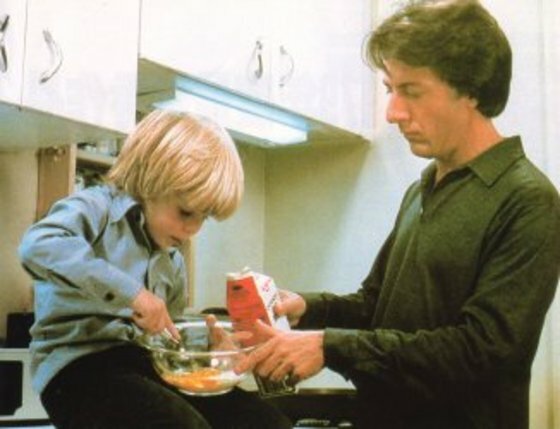 There are so many reasons to see Kramer vs. Kramer. The acting is heartfelt and phenomenal, it had four acting nominations and took away two for Streep and Hoffman. The stirring story of rising to the occasion of single-parenthood is moving and can capture the heart of anyone, whether or not you life has been affected by divorce in any way. 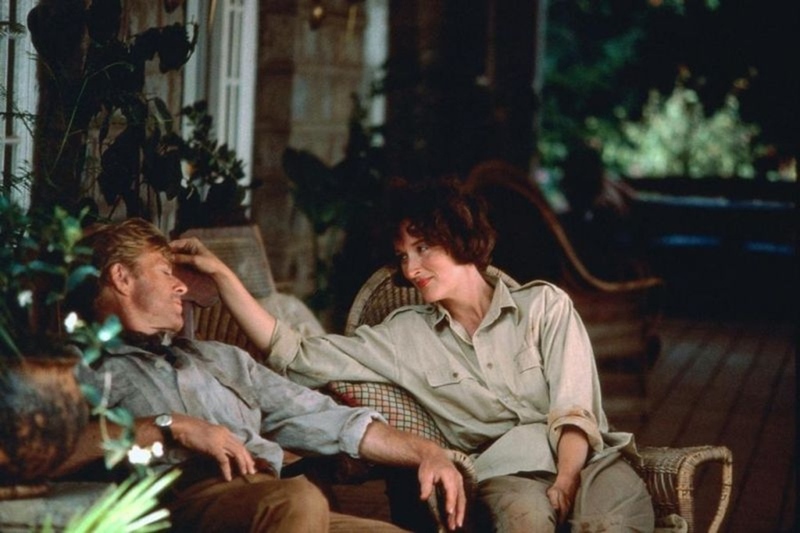 Out of Africa can easily be summed up as “Meryl Streep in Africa. Adventures and romance occur.” That’s way too easy and doesn’t do the film justice at all. 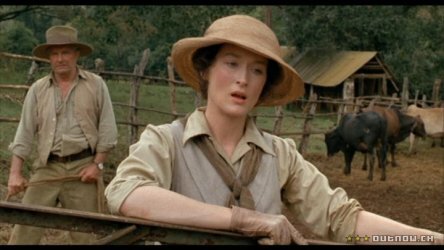 Karen (Streep) is a Danish woman who marries her lover’s brother, Bror (Klaus Maria Brandauer), out of convenience and to have the title of Baroness. It seems she’s destined for a normal, boring woman’s life, until her husband moves them to Kenya, Africa. They agree to run a cattle farm, but when she arrives, Bror informs her that they’re going to grow coffee instead, a risky task that has never been tried at that elevation before and won’t turn a profit for years. Throughout their marriage, Bror pulls more stupid surprises like this on Karen, but thankfully, it only makes her a stronger woman. World War I starts up and the men go to protect their lands, while Karen is left to take care of the whole farm. When people come around to round up all the women and children for their safety, Karen rides out into the African wilderness to join her husband and the men to fight. We watch in excitement as Karen realizes that she has no fear and can scare away lions attacking her camp in the middle of the night. Since Bror is gone most of the time, Karen starts seeing a hunter, Denys (Robert Redford). Their relationship grows from him making sure lions don’t attack her to romance where he kind of moves in with Karen. But the fact that he goes on safari without her bothers Karen. It seems that she yearns for the traditional life of a wife, but it’s too late forthat. She’s a part of African colonization, helps educate the natives, befriends them and runs the coffee farm she didn’t even want all on her own. The epic story of a woman stepping up and braving the wilds of Africa all around her is astounding and moving. 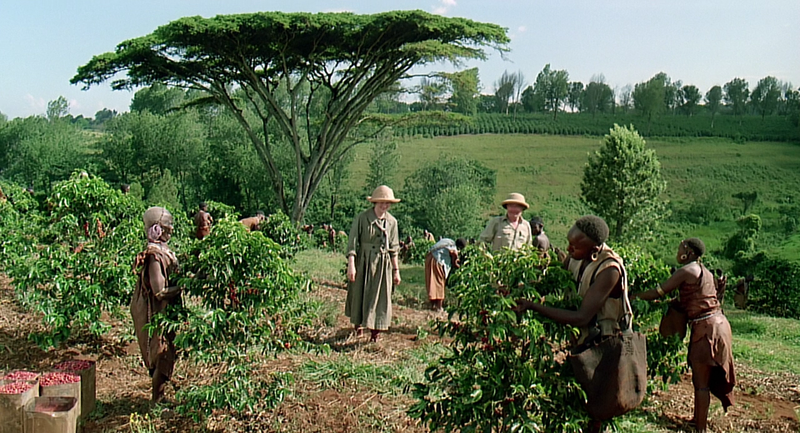 What really won me over to let Out of Africa reign in 1985 was the cinematography. From beginning to end, every shot is just beautiful. Images of giraffes running across the African plane in the hazy sunset is just breathtaking. The airplane scene is like meditation for the eyes and ears. Though it’s three hours long, this film is one to be seen because of what you see.